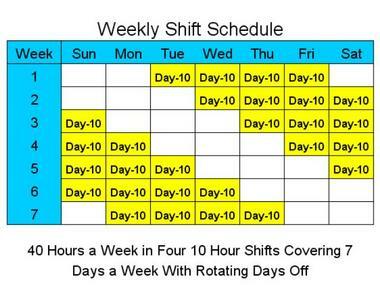 An employee shift scheduling package that including 112 different 10 hour scheduling templates to cover 1, 2 or 3 shifts a day for 7 days a week. Quite often businesses need to add or subtract staff to accommodate a growing or shrinking business and need a scheduling solution to reflect their new staffing levels. 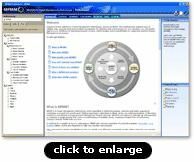 These templates can be used to provide any number of people per shift and can quickly and easily accommodate changing staffing levels. The templates display weekly tables that clearly show days and shifts worked by each person each week. All of the templates are set up to rotate the days off for each person, and everyone is treated in a fair and impartial manner regarding shifts worked and days off each week. Usually more than one template can be used to provide the coverage that you need giving you the opportunity to present a number of different scheduling options to your managers and employees for their consideration and approval. While most of the templates average about 40 hours a week, they vary between about 31 and 53 hours a week, giving you lots of choices to fit your staffing needs with available personnel. And, those templates that don?t have about 40 hours a week provide a good framework for you to add and delete weekly shifts to match your unique daily staffing requirements. 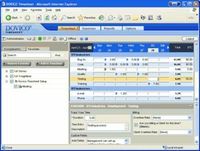 The scheduling templates are configured to work seamlessly with our Series 3 Rotating Shift Schedulers for creating schedules of up to 52 weeks while providing vacation scheduling and overtime management tools as well as several scheduling outputs including a file to transfer the schedule to your Outlook Calendar and the ability to automatically e-mail schedules to your employees. Other scheduling packages are available at our website for 8, 10 and 12 hour shifts for 5, 6 and 7 days a week.